Courtesy of Westminster Fibers, we have this snazzy tank top in Butterfly Super 10 Cotton! This is the drop stitch cowl I passed along to you last year, but reworked for 2 balls of Malou Bicolor. I knit this in one evening while watching a football game! Size 13 circular needle, 24″. Cast on 67 st, join circle by slipping last st to left hand needle and start 1st round by K2tog (66 st). You can put a full twist into the cast on row (shown), or leave the twist out as you prefer. Rounds 1 & 3: K Rounds 2, 4: P Round 5: Knit, double wrapping each stitch. Tip: be sure not to pull your second wrap tight! Round 6: Purl, dropping the extra wrap on each stitch. Repeat these 6 rounds 5 times, then repeat rounds 1-4 once and bind off loosely. Weave in ends, then snuggle up! Both are in the Winter Drift book. And Drift comes in many gorgeous colors! Remember, if you see a design you want to make & need the yarn requirements, just ask! We’re just an email away. Mist comes from Twilley’s of Stamford, a name known for quality throughout the UK. Mist is an enticing blend of alpaca, wool and synthetic that fills out your stitches with a delicate halo– a Mist! And it comes in the most becoming “misty” colors, too. This is my design for Mist– a simple boat-neck pullover with extra long ribbing and embellished with an easy-to-knit lace accent. 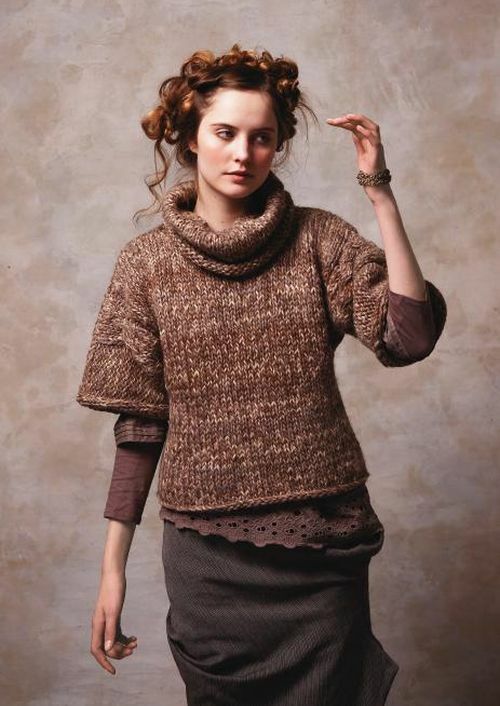 The pattern is currently free with purchase, and a medium (38-40″) takes only 8 skeins–That’s a $50 project! This shape looks great on almost everyone–the neckline is flattering and draws attention to your face. If you need another size, just email Laurel@handknitting.com for yarn requirements based on your finished chest measurement. discontinued fashion yarns– Lang, Trendsetter, Rowan, and more! Everything on Dyed and Gone is a great value — discounted from 40-70%, plus there is FREE SHIPPING on every order within the USA! Wow! New yarns coming all the time…. Brand new from Zitron, it’s Patina & Patina Color! 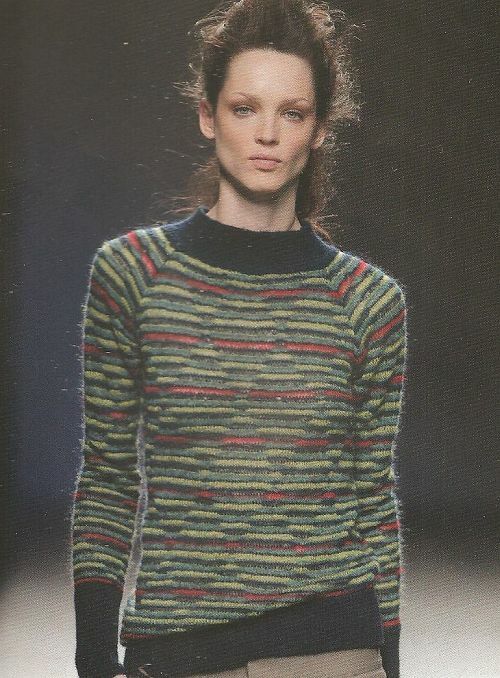 This sweater is from designer Sara Coleman shown on the Madrid runway, but this theme is everywhere in all sorts of styles — multicolored body & contrasting trim. We suggest using Patina with the Ann Norling basic top down raglan for a pullover with 1-2 balls in the contrast color for a piece you’ll wear for years. Could easily be a cardigan–that’s one of the joys of hand knitting–get just what you want!! 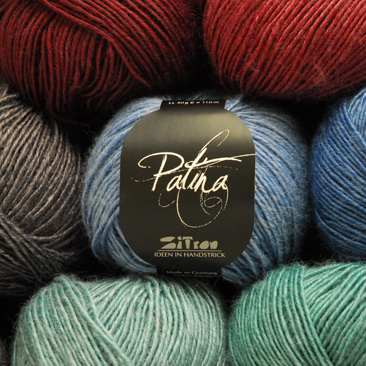 Zima Color 8-ply is a quick-to-knit DK weight, but with all the desirable qualities of Regia sock yarn, including being machine washable! Just one ball (200g) is enough to make this set. What a beautiful look, and it all comes automatically with the Zima self patterning yarn that changes colors while adding geometric pattern details. It’s reminiscent of the S&S Mexiko yarns that were so popular. This is a limited edition yarn, so get yours today. Be sure and thank Abi by dropping by her Etsy shop! What a great last minute project for crocheters! So elegant, and so useful too. These instructions are converted into American crochet notation. If you want the original English version and to see other pictures, please visit the Cult of Crochet blog. We recommend either Super 10 cotton or Rowan Creative Linen for these lovely table accessories. This free pattern was written with Rowan Alpaca Chunky in mind. But the stitch pattern can be used with almost any yarn. The bigger the yarn, the snuggli-er it will be. And the faster you can knit it! The stitch pattern is reversible, so there’s no wrong side.